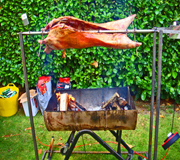 Nyama provides specialist Spit Roast Catering to Private, Corporate and Wedding Parties throughout the UK. Being one of the most experienced BBQ Style Catering outfits in the country you can be assured of excellent Quality Spit Roasts. But at Nyama we do not only focus on great food but also on exceeding our customer expectations with our friendly, going-the-extra-mile type service. We can Spit Roast almost anything! Not only do we Spit Roast a Hog or Lamb to perfection but we've Spit Roasted all types of Venison and even a Water Buffalo on a few occasion. Its not only Spit Roasting though. We can also do most types of BBQ styles. We do South African Braai's , Argentinian Asado's, American "low-n-slow" Bar-B-Que's and even Halal Indian Style BBQ'ing. So check out our on line Menu's but be sure not to do this on an empty stomach!